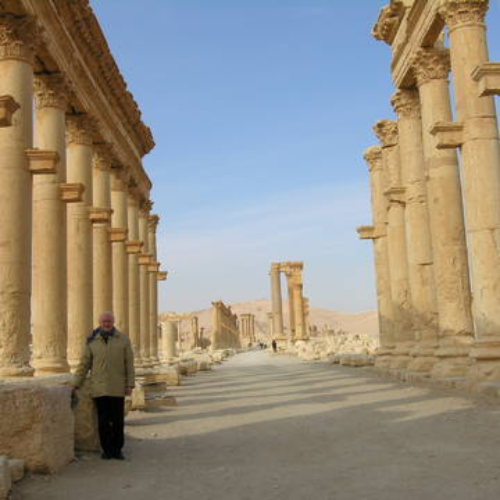 A Journey to Palmyra is a critical aesthetic experience that seeks to disrupt our habits and rituals. 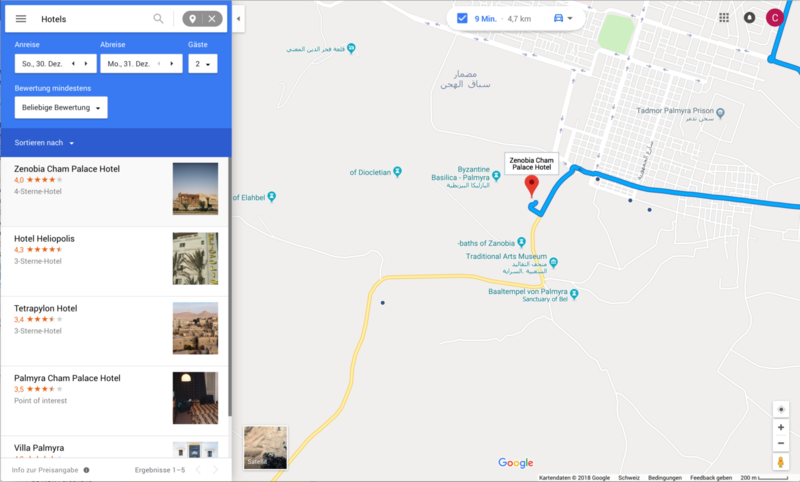 The project involves two common elements that are embedded in everyday life but rarely questioned: on the one hand, media coverage of war, and on the other, navigation using Google. 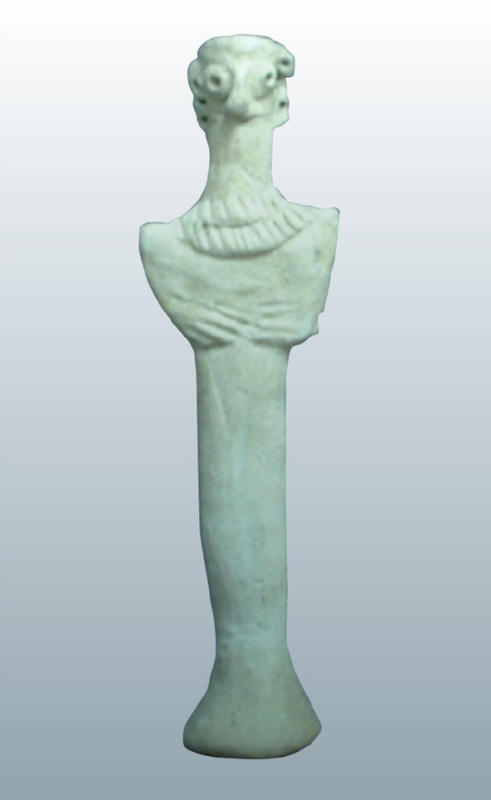 It represents a cunning way of questioning two things that have become commonplace. 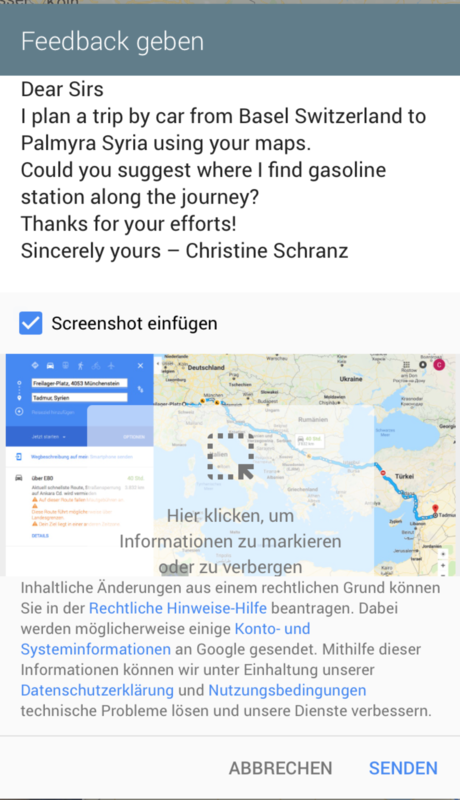 In a world of fake news, filter bubbles, and artificial intelligence, how prudent is reliance on a source of information? 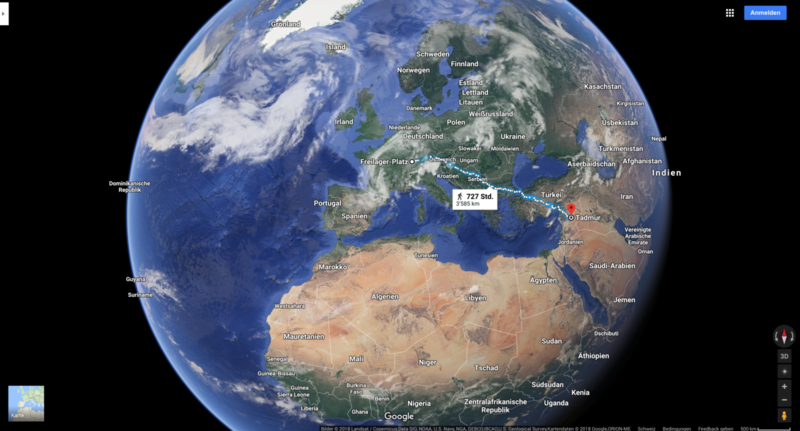 Google Maps and directions are firmly embedded in our everyday lives. 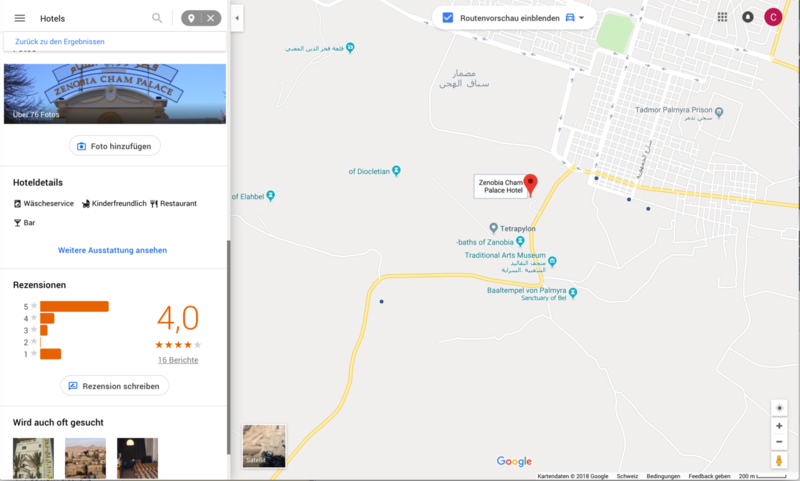 We use those services every day to find a location, route, or restaurant and navigate to our destination with the aid of a technological device. 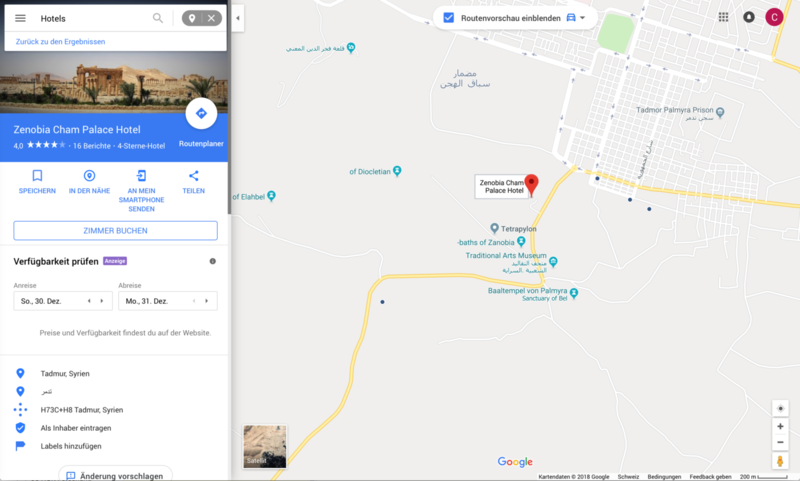 They suggest a world in which we are free in the selection and production of information, but how can we actually be certain that the information is objective or even correct? 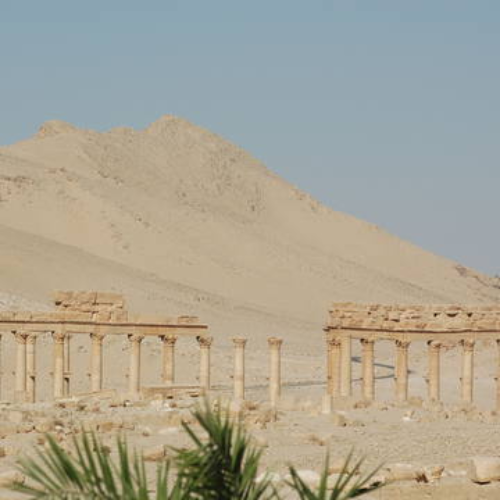 A Journey to Palmyra ist eine kritische ästhetische Praxis, welche mit unseren Gewohnheiten und Ritualen brechen möchte. 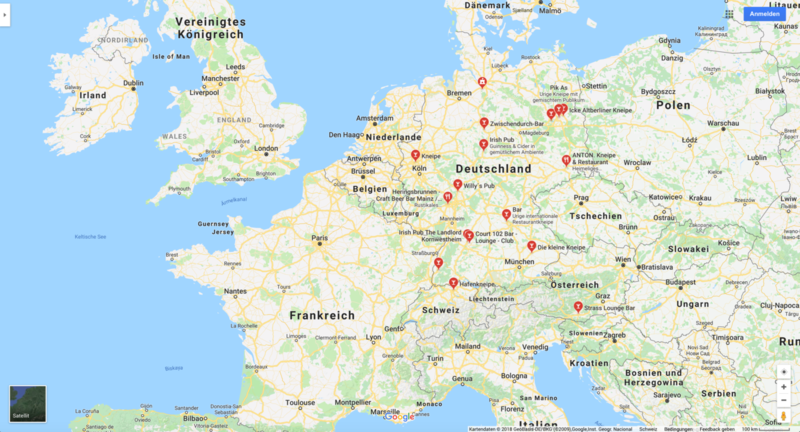 Das Projekt beinhaltet zwei uns sehr vertraute Situationen, welche fest im Alltag verankert sind, wir aber kaum hinterfragen oder uns die Zeit nehmen, kritisch hinzuschauen: Einerseits die Berichtserstattung in Echtzeit aus einem Krisengebiet, andererseits die Navigation mit Google Maps. 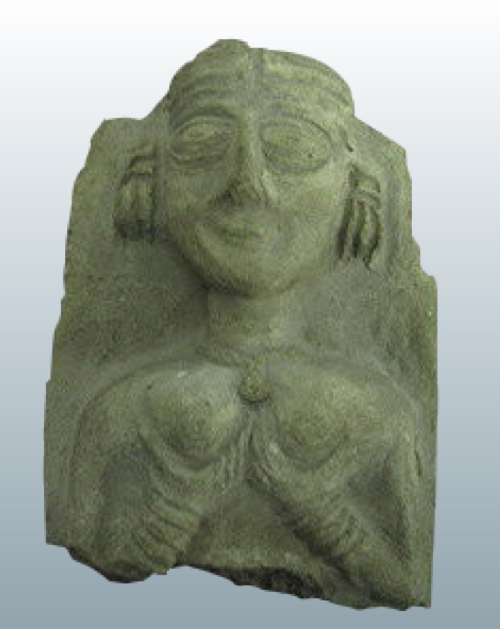 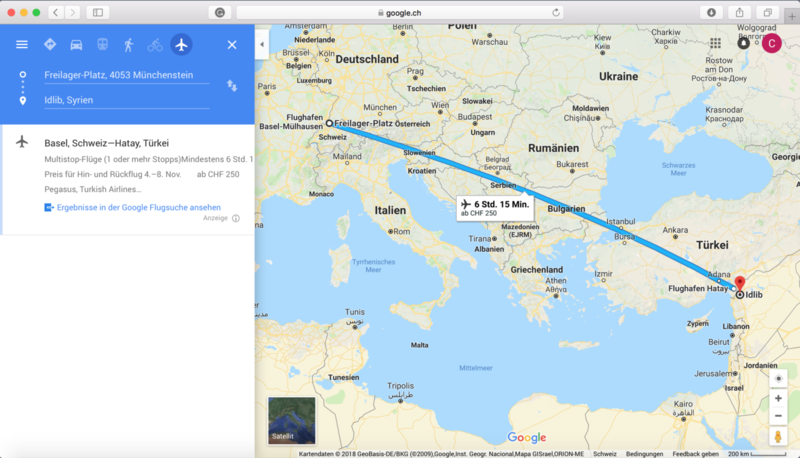 In einer hinterlistigen Art werden diese beiden Zustände, an welche wir uns gewöhnt haben, thematisiert und hinterfragt. 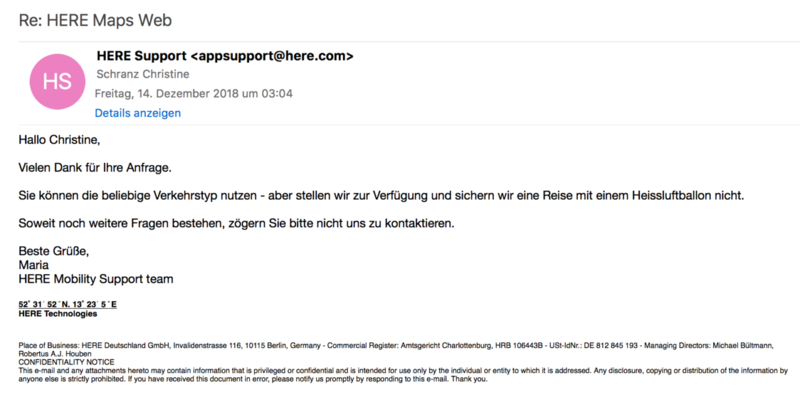 Inwiefern ist in einer Welt voller Fake News, Manipulation und KI eigentlich noch Verlass auf die Informationsquelle? 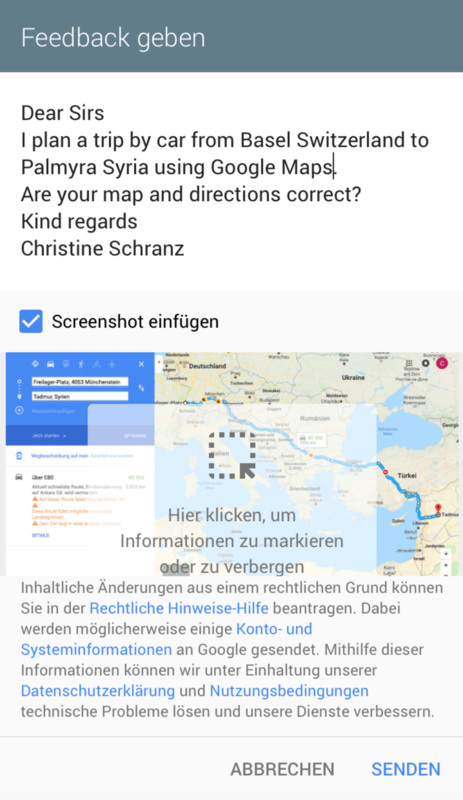 Google Maps und Wegbeschreibungen sind fest in unserem Alltag verankert. 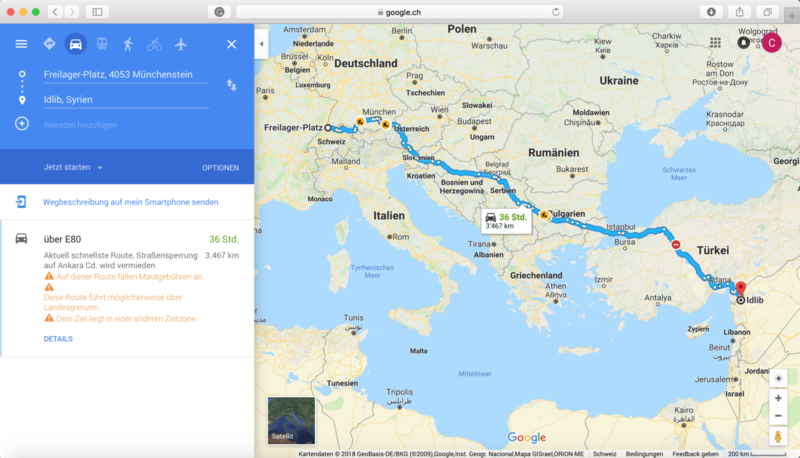 Täglich greifen wir darauf zurück, um uns einen Standort, einen Routenverlauf oder ein Restaurant anzeigen zu lassen und uns mit technologischer Unterstützung dorthin zu navigieren. 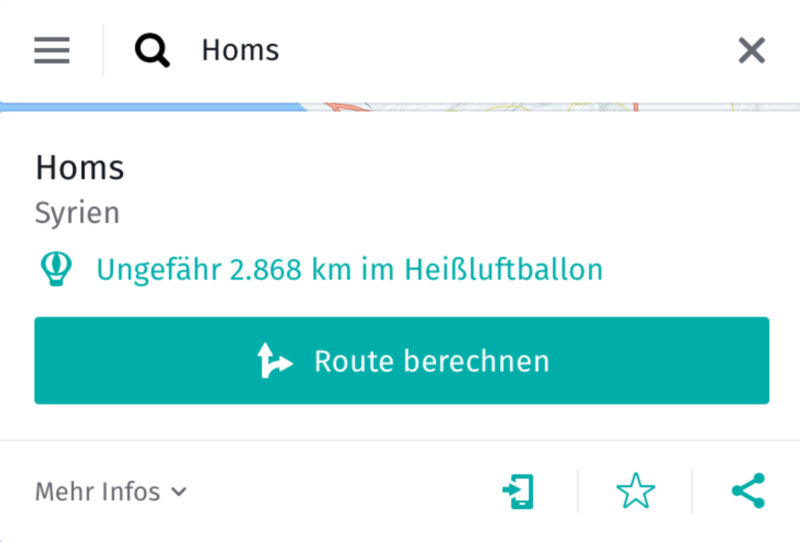 Die technologischen Dienste lassen uns glauben, dass wir in Auswahl und Produktion von Informationen frei sind. 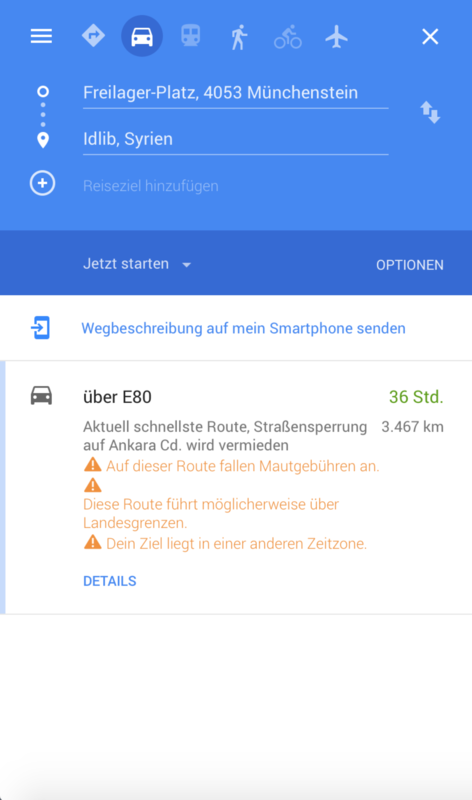 Doch woher nehmen wir eigentlich die Gewissheit, dass die Informationen objektiv, ja korrekt sind? 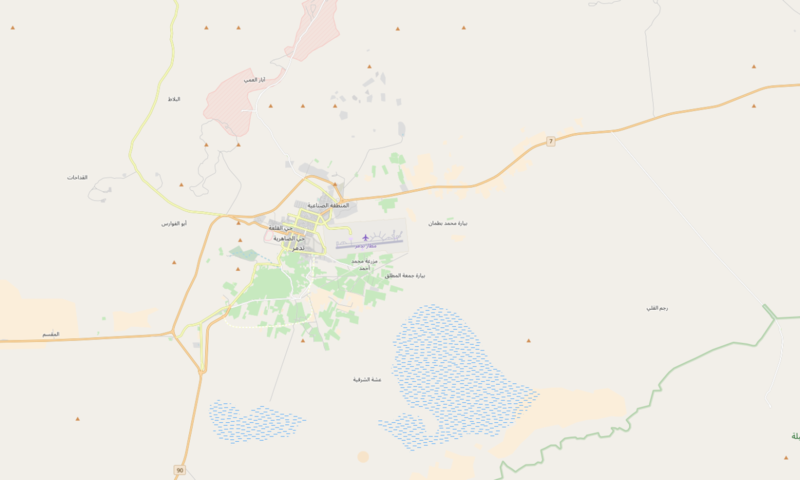 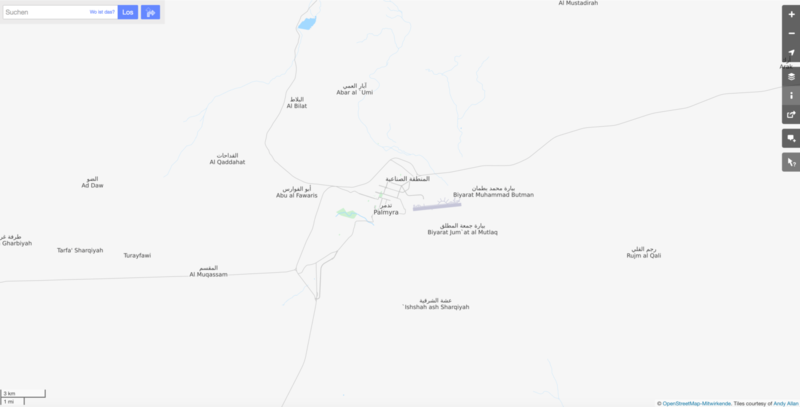 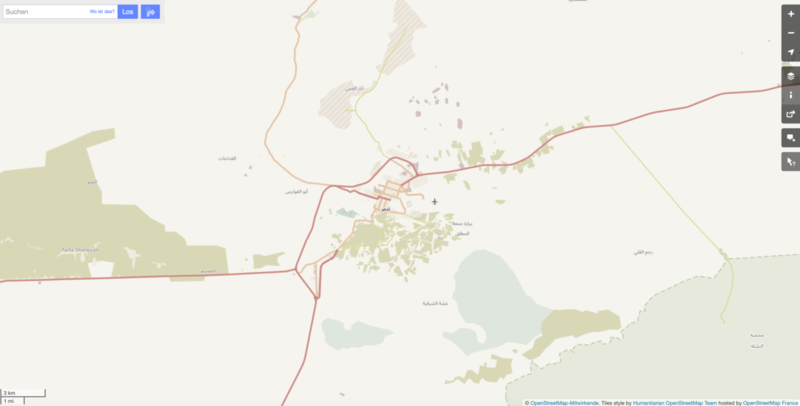 "Terrororganisation, Isis, ISIS, Daesh, DAESH, Isil, ISIL, ISIS Caliphate, Islamic State, salafistische Miliz, Kalifat, Jihadismus, Dschihadismus, Homs Governorate, Khaled Asaad, Military intervention, Regime Bashar al-Assad, Temple of Bel"
By dragging the map you can load live google places nearby matching your current map view. 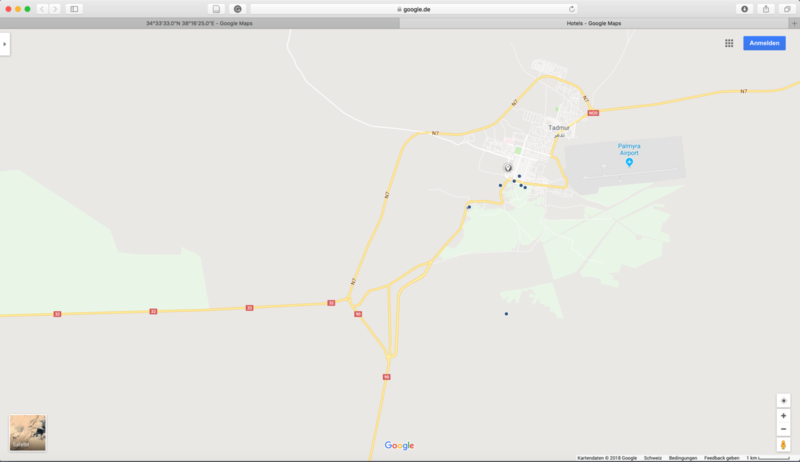 To get more acurate results zoom closer into the map. 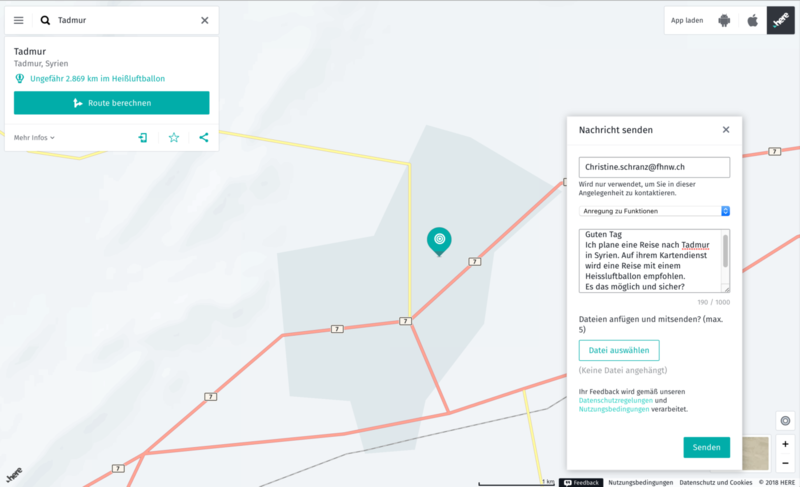 This layer containes live news sources from Reuters, including The Guardian, BBC News, Time, Al Jazeera, Der Tagesspiegel, Fox News and many more. 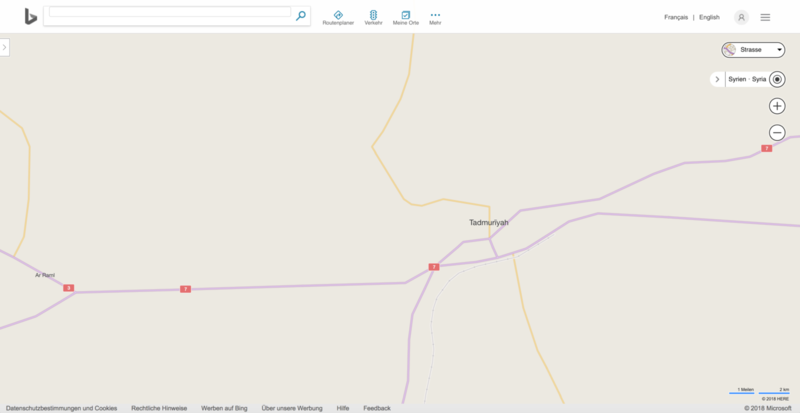 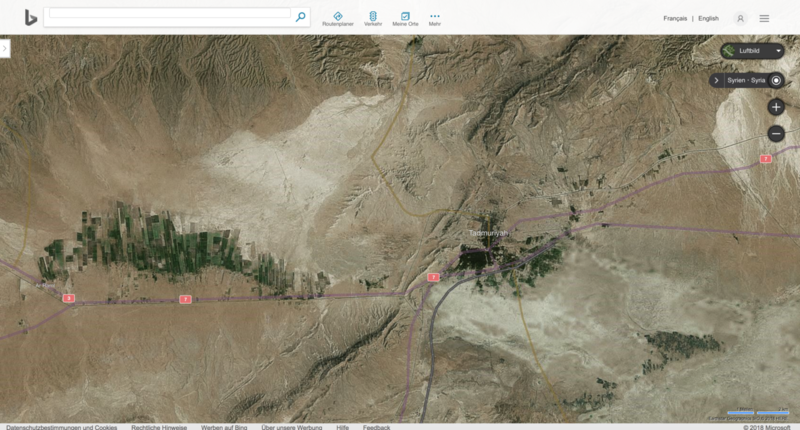 This layer containes live tweets including the keywords #palmyra, #syria and/or #daesh. 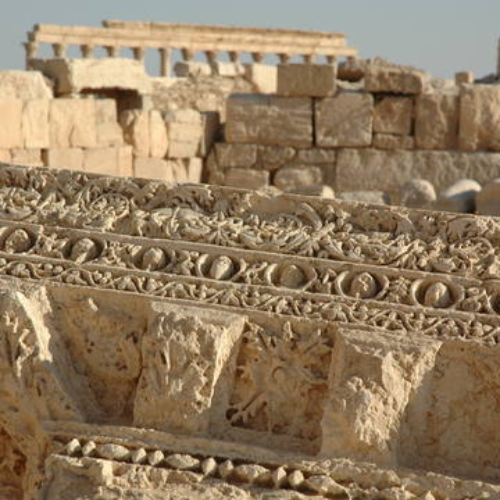 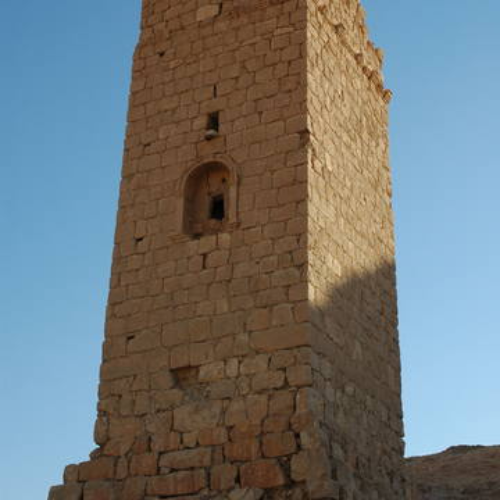 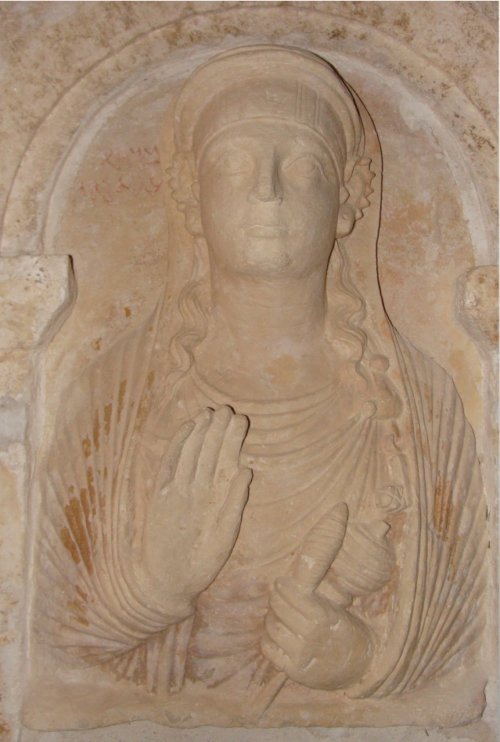 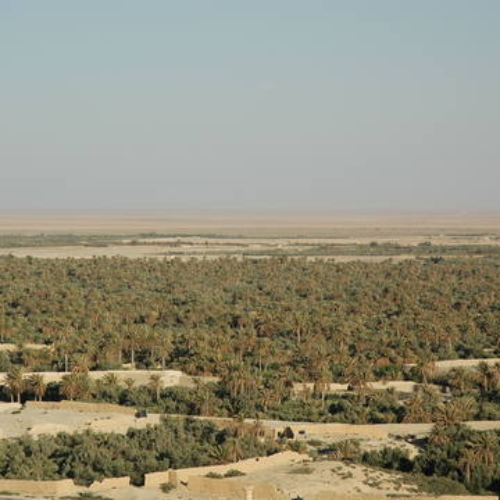 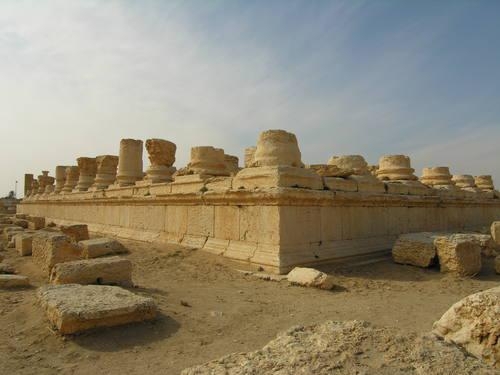 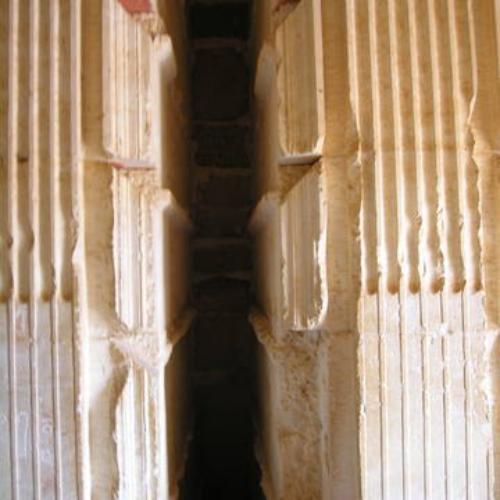 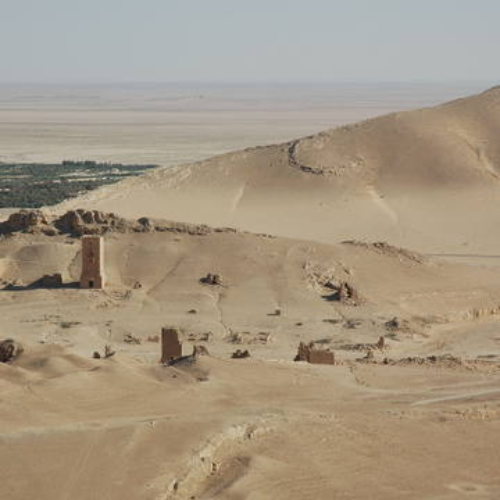 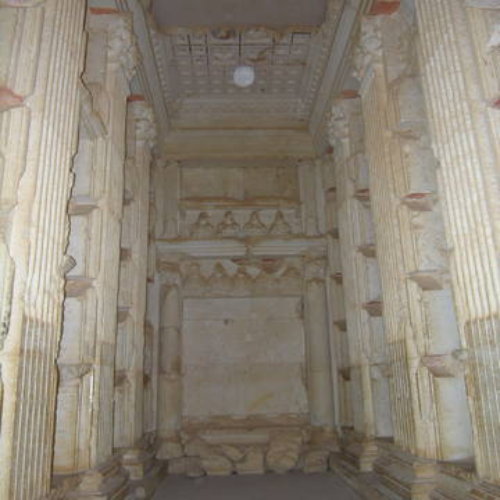 This layer containes sites from the region of palmyra which are protected by Unesco. 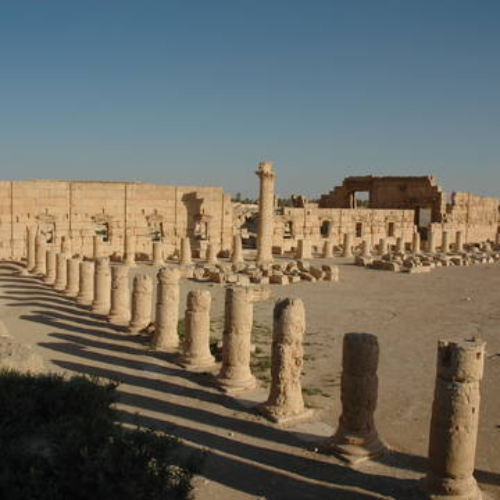 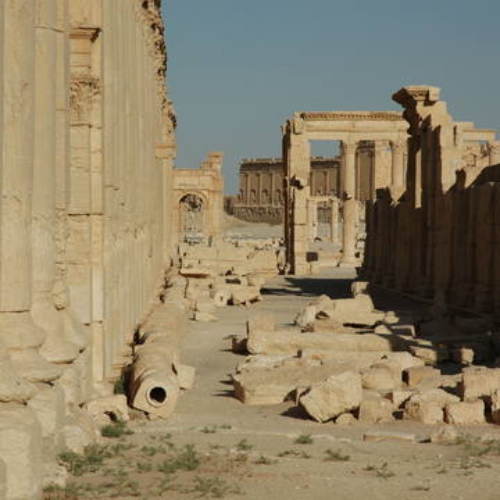 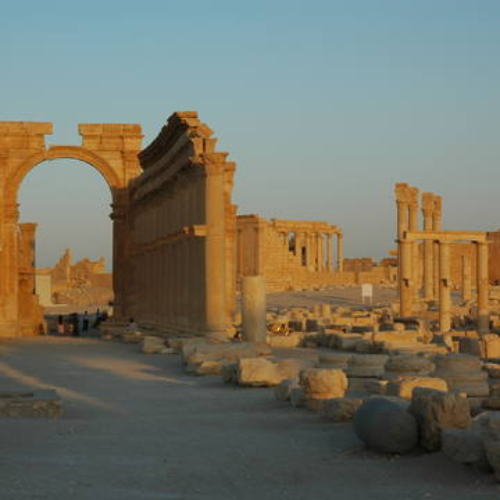 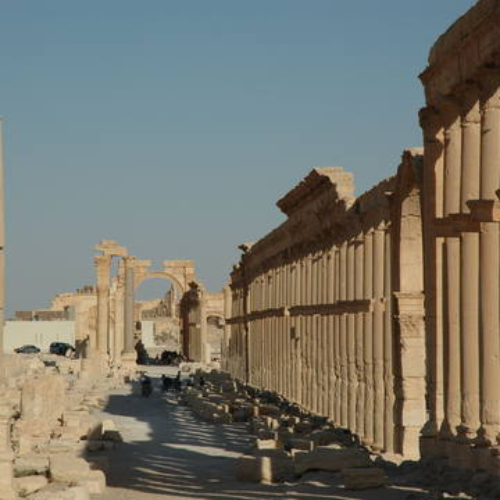 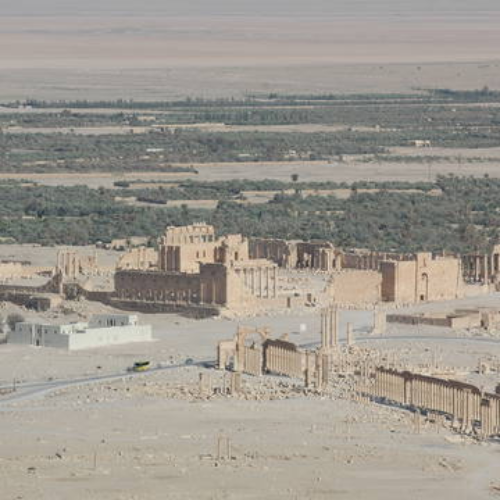 Because of the conflict in Syria, the UNESCO cultural monument of Palmyra can no longer be visited. 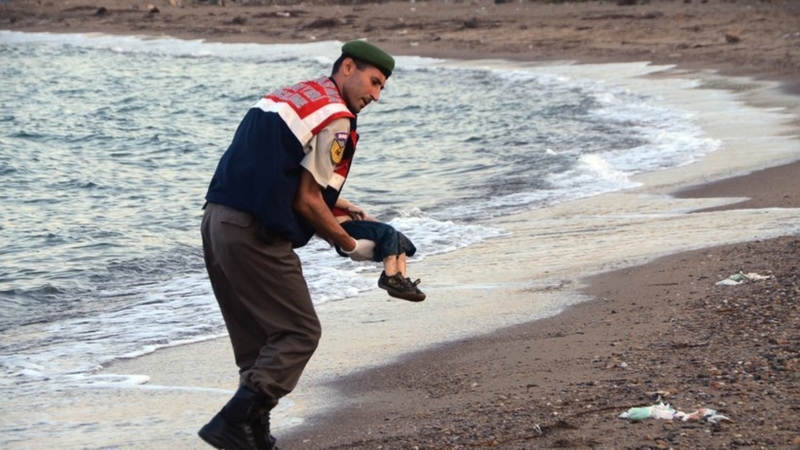 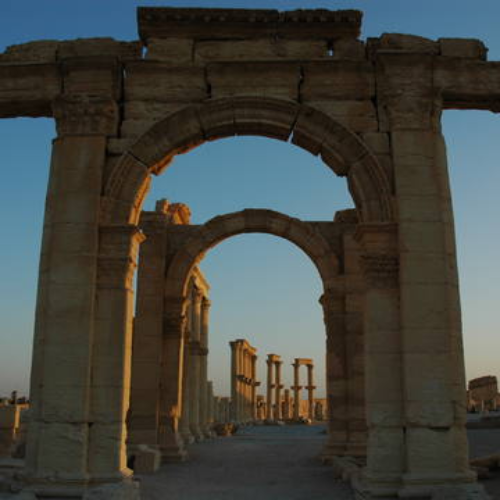 The occupation by ISIS has resulted in devastation, looting and its exploitation for propaganda purposes. 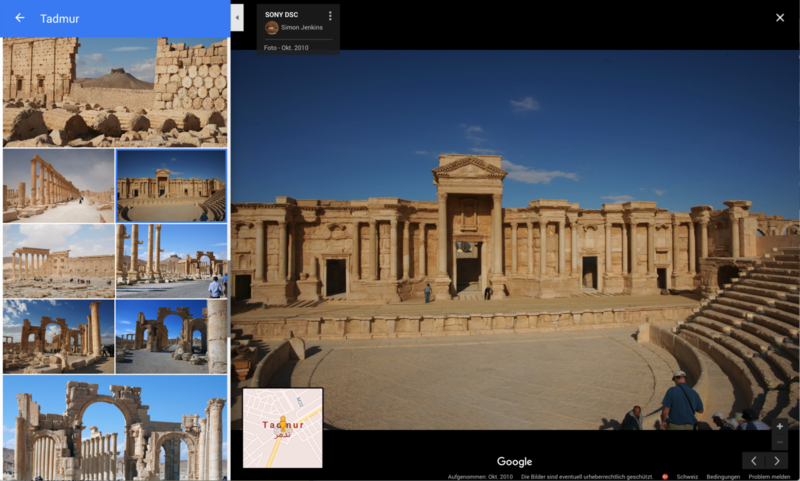 However, on the Internet, the place as a touristic spot still exists and has an odd parallel existence. 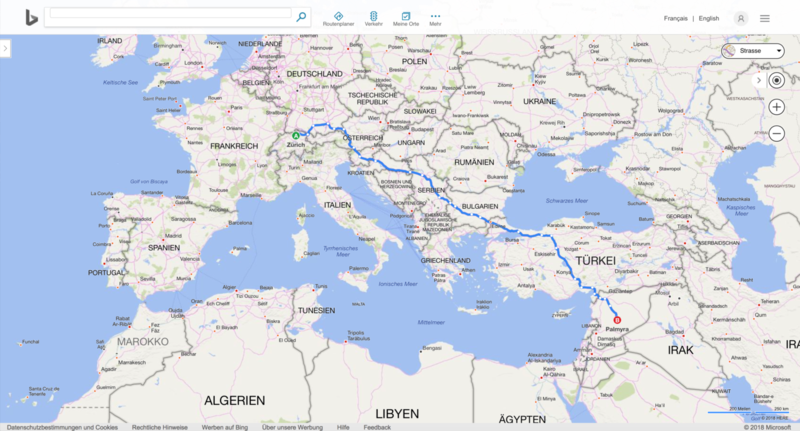 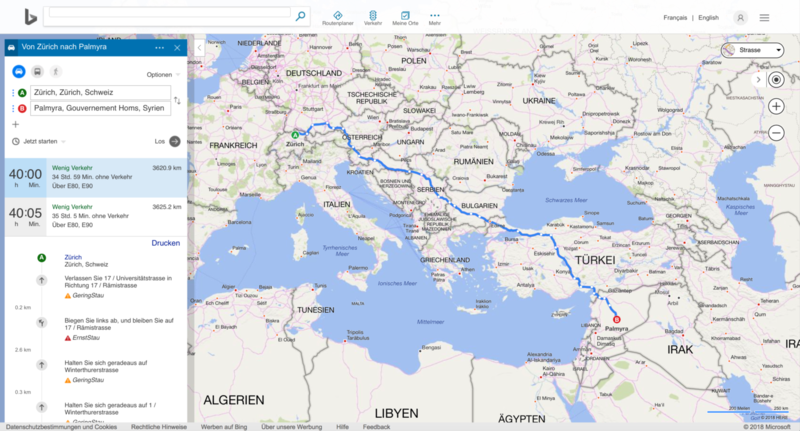 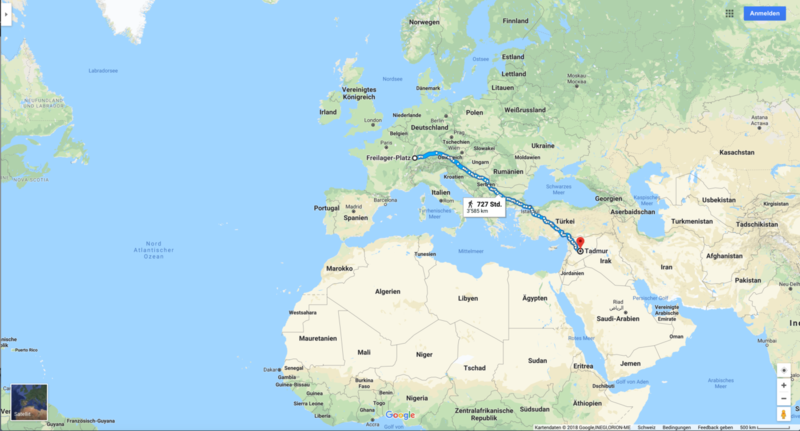 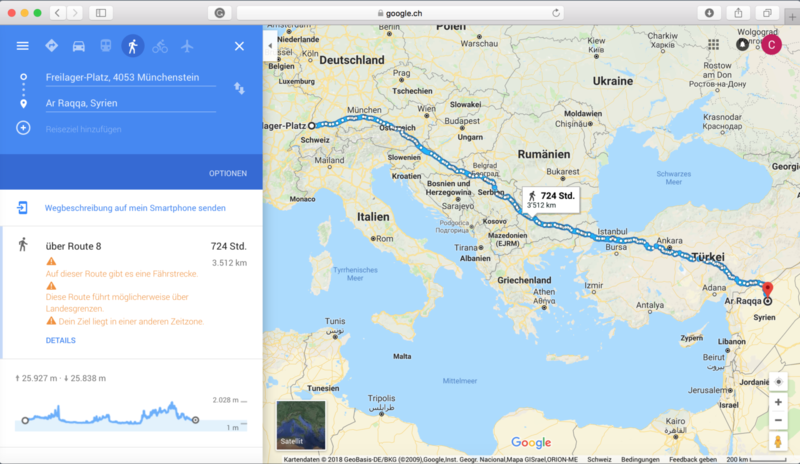 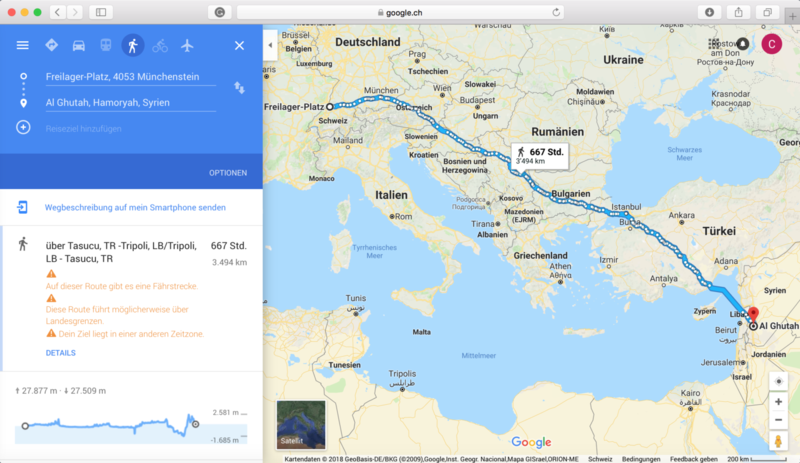 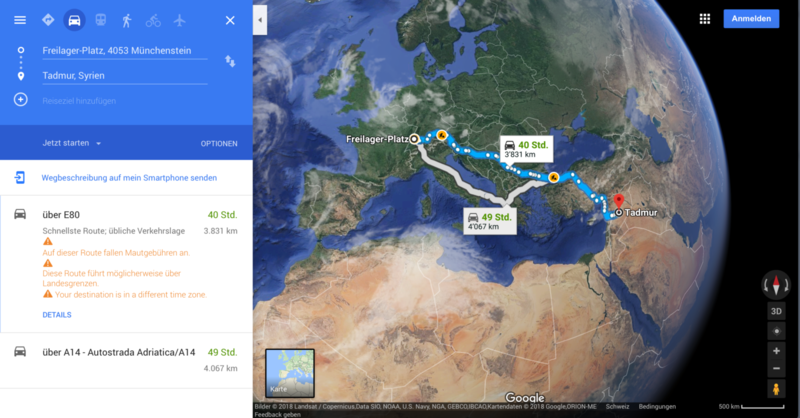 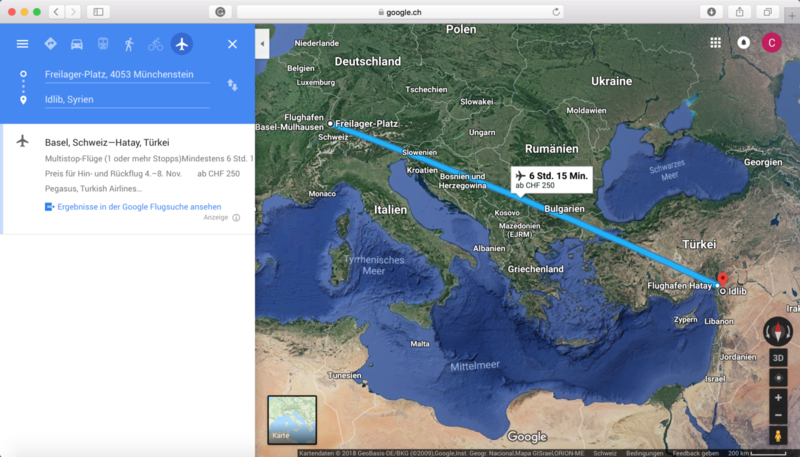 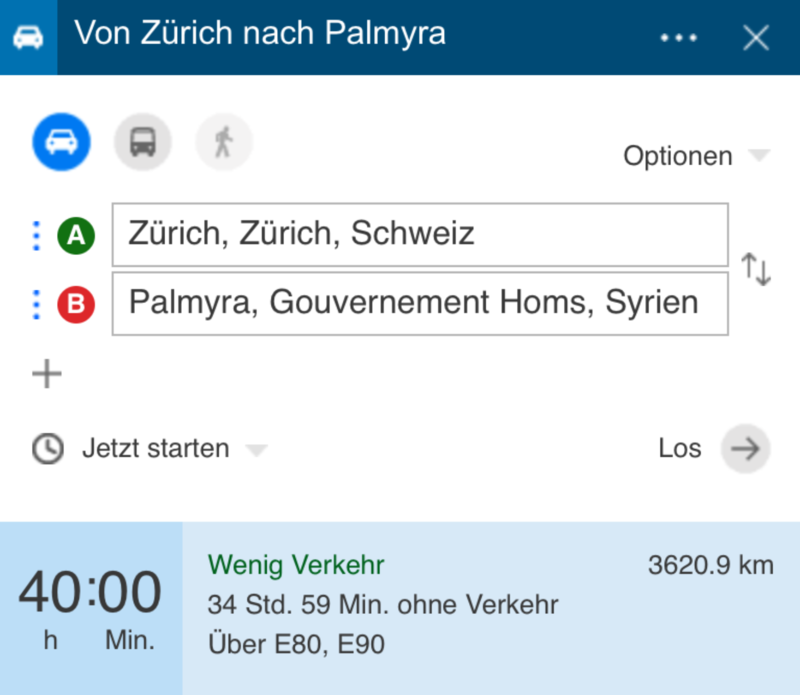 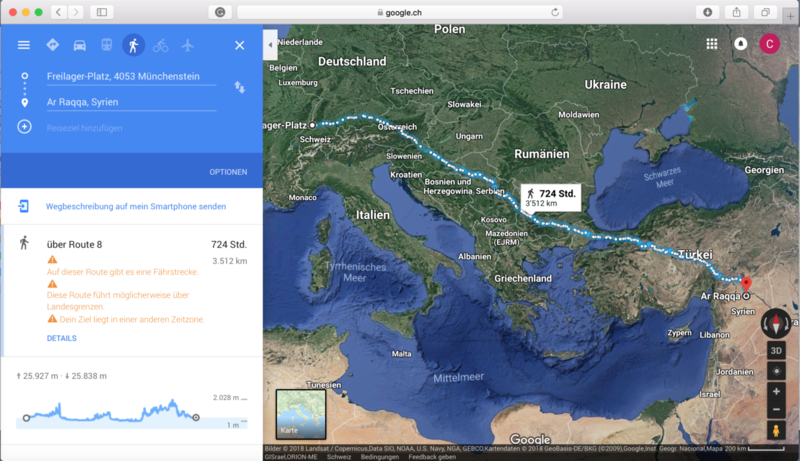 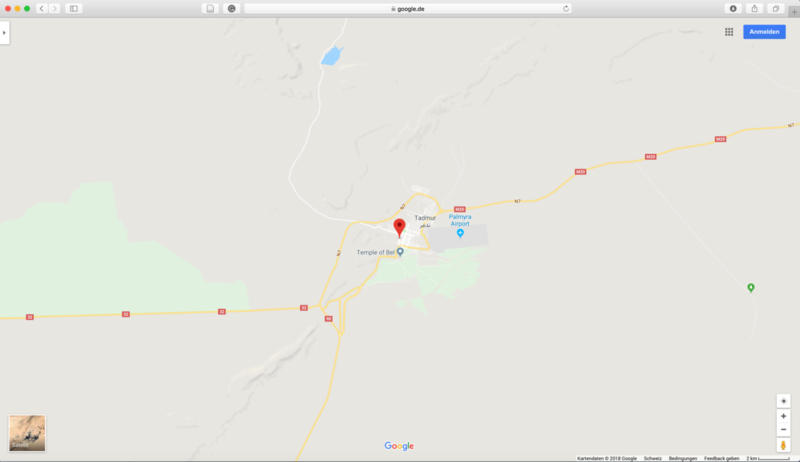 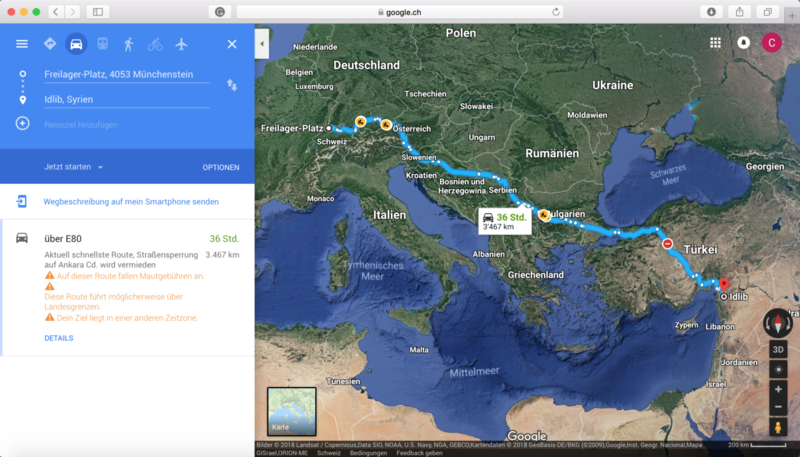 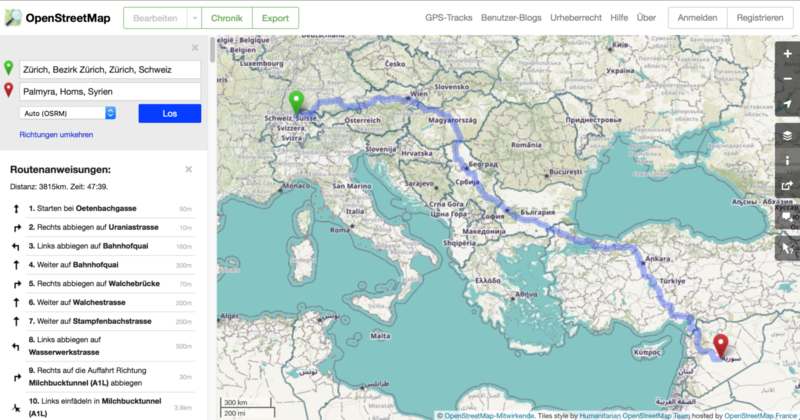 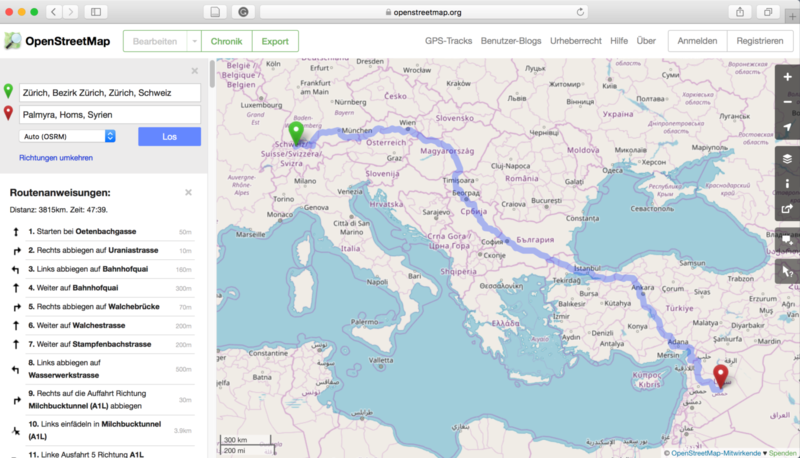 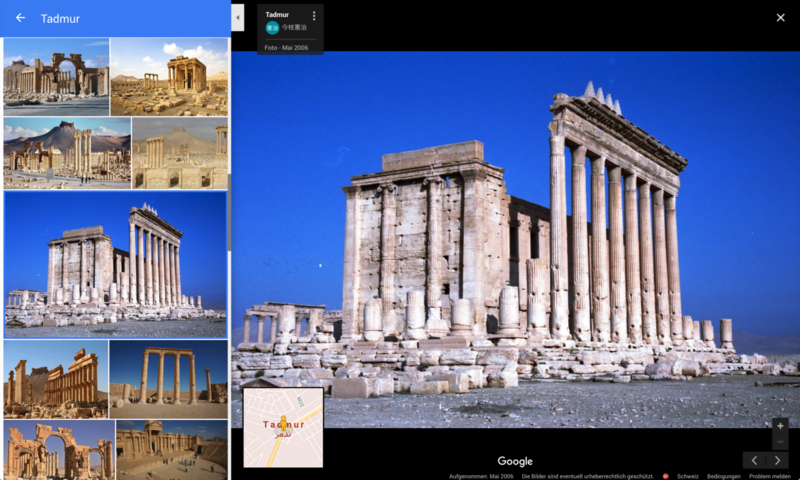 With Google Maps or any another free map service, it is possible to plan a trip to Palmyra: consulting the Internet on 21th March 2018, location-based services suggested traveling from Basel, Switzerland to Tadmur (Arabian for Palmyra) with a drone (HERE map: distance 2’869 km), a hot-air balloon (HERE map: distance 2’894 km) or by car (Google Maps: 40:44 hrs., low traffic). 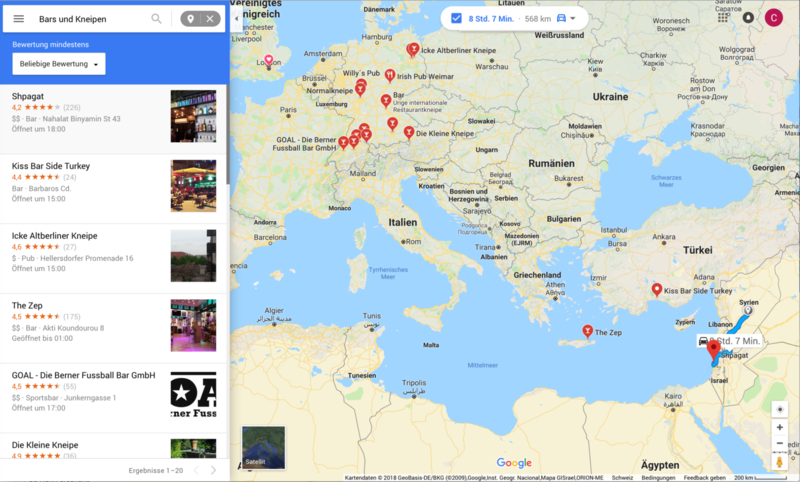 There are hotel recommendations close to the site and a list of restaurants and things to do nearby—although the closest bar is located in Austria (Google Maps). 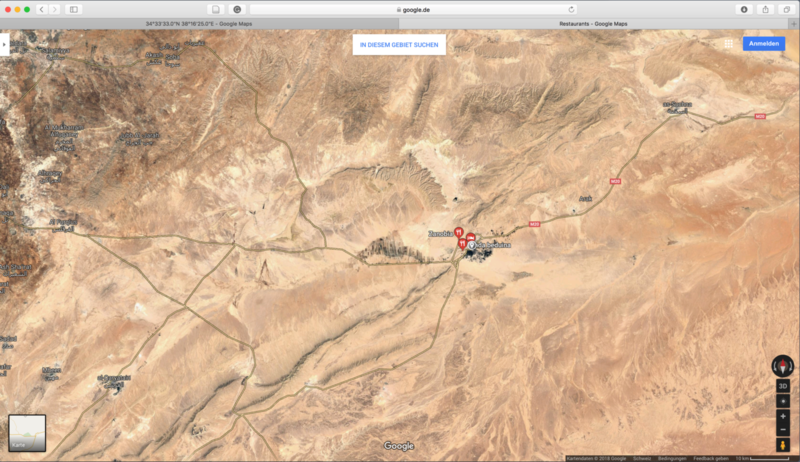 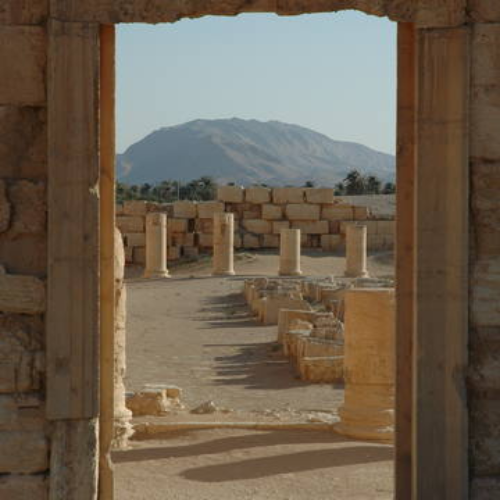 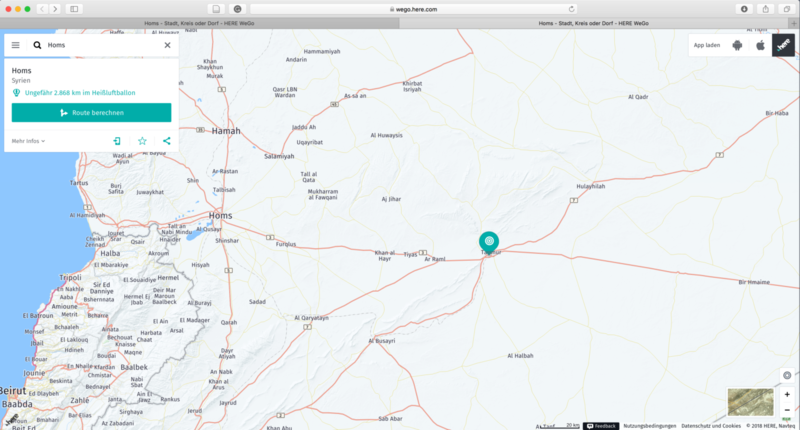 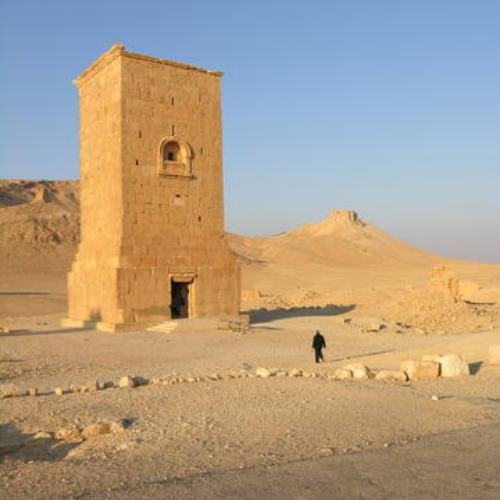 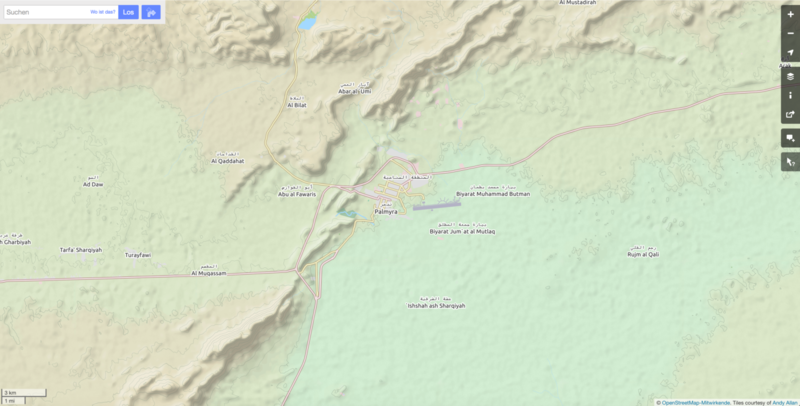 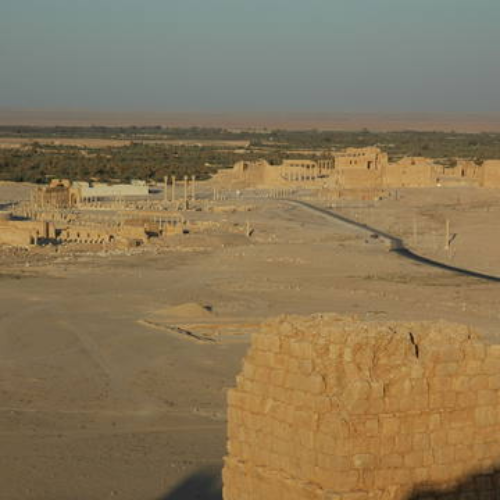 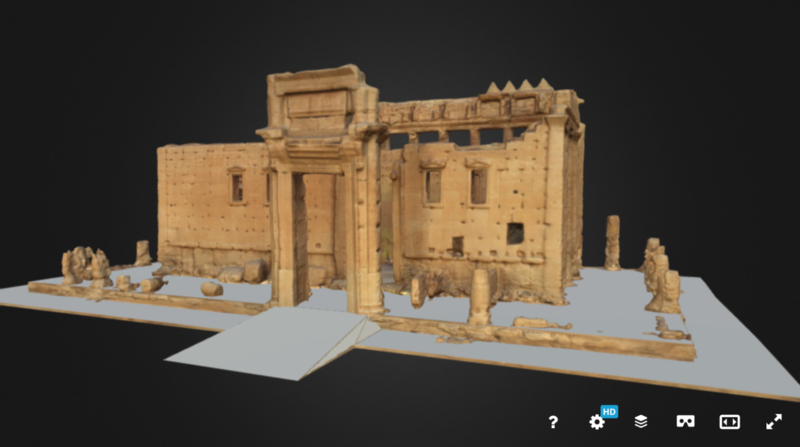 In A Journey to Palmyra, users can travel to Palmyra and explore geo-located data about its cultural heritage. 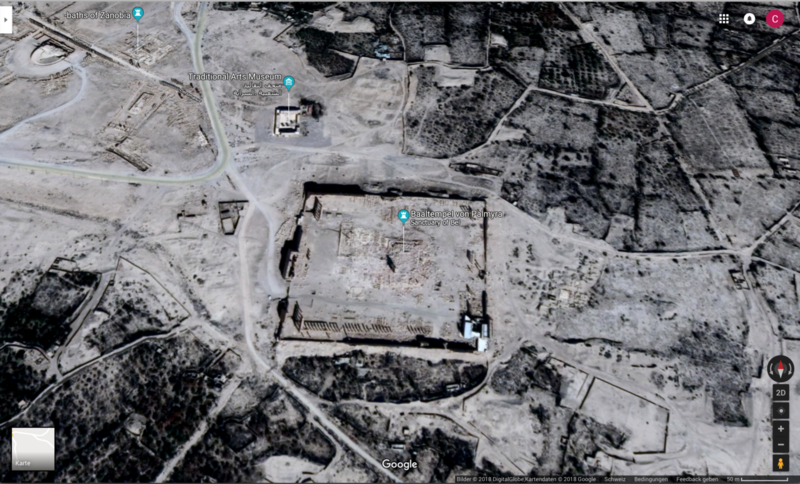 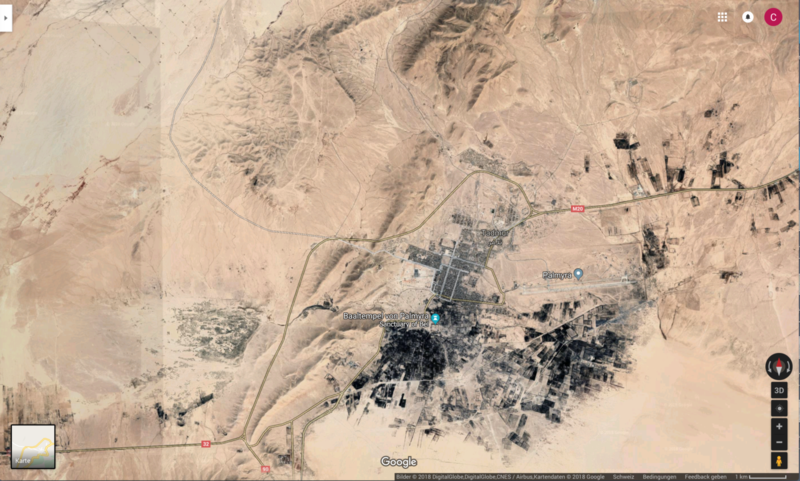 The website offers an interactive map of what remains from Palmyra and shows the afterlife of the site in digital traces, memories and data collected on the Internet. 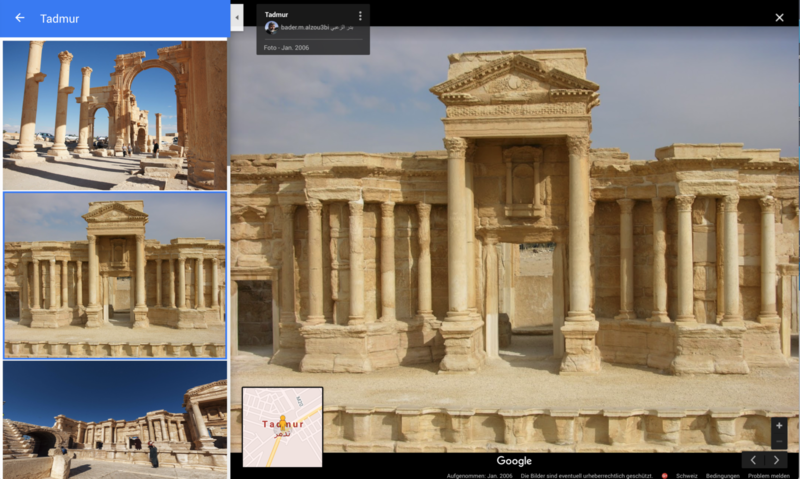 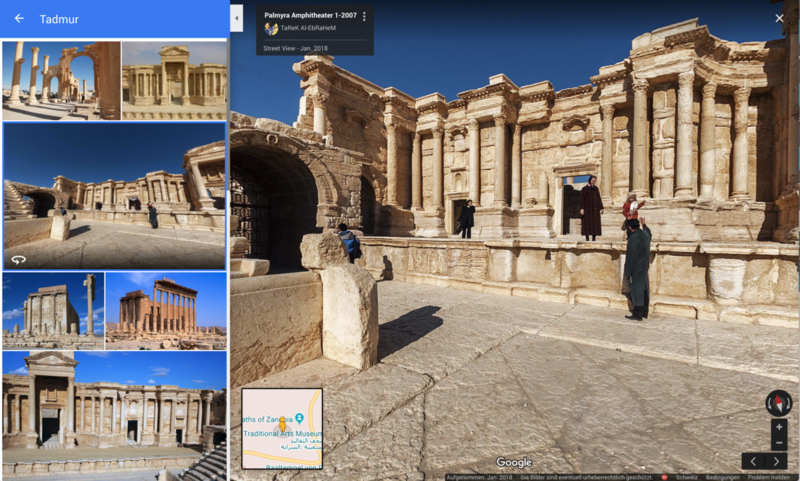 For Palmyra, the map becomes a visual episteme of a digitally constructed world—to a sight which no longer exist. 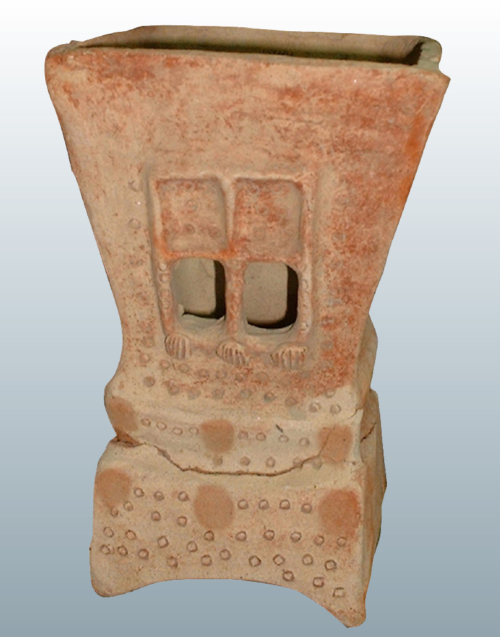 Thus, it emphasizes the parallel lives and inner logic inherent in digital cultures. 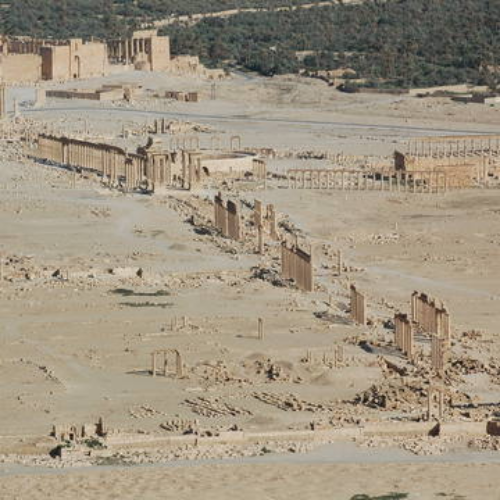 The critical-design practice is thus meant to widen our understanding, not to allow us to forget Syria or forget those who are suffering. 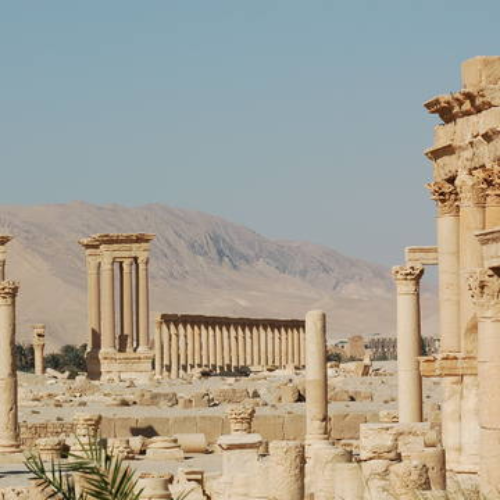 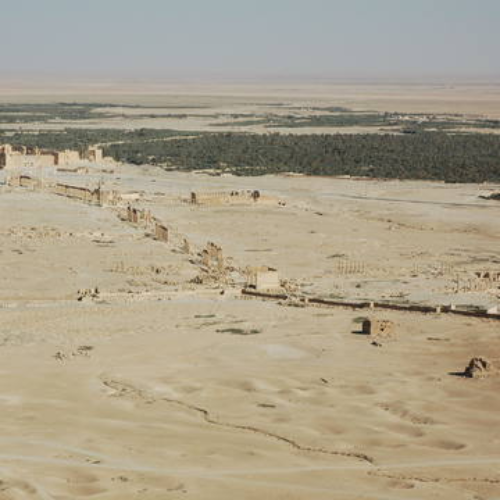 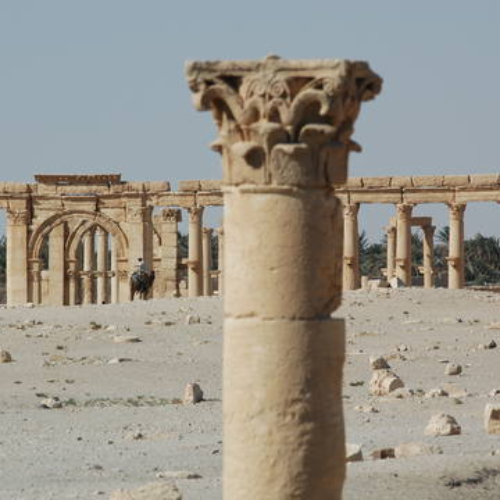 What remains of Palmyra? 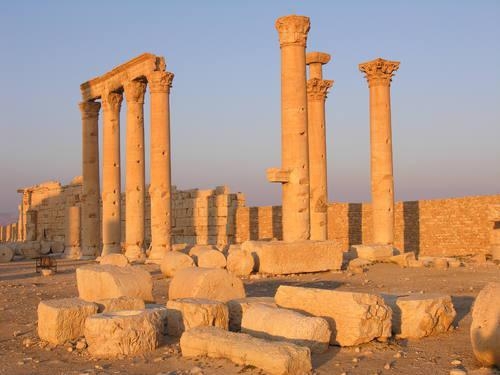 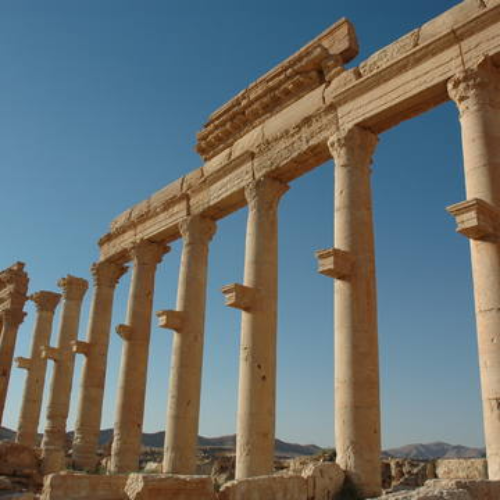 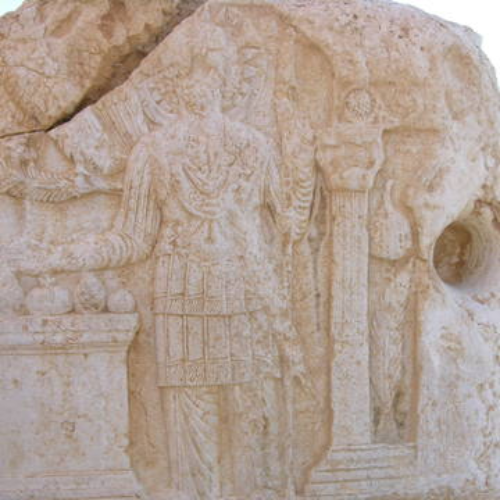 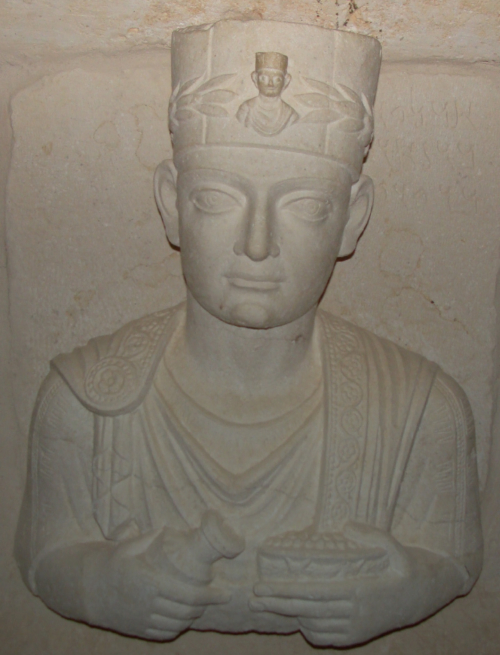 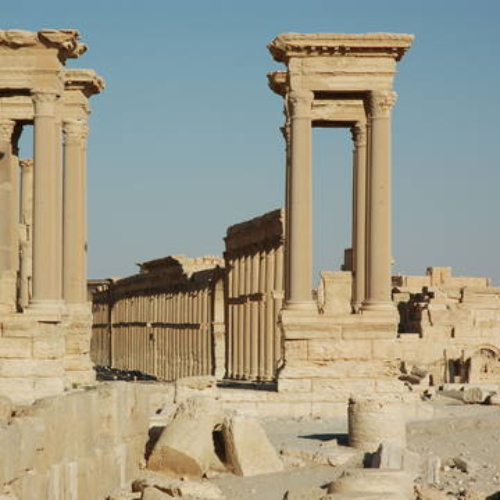 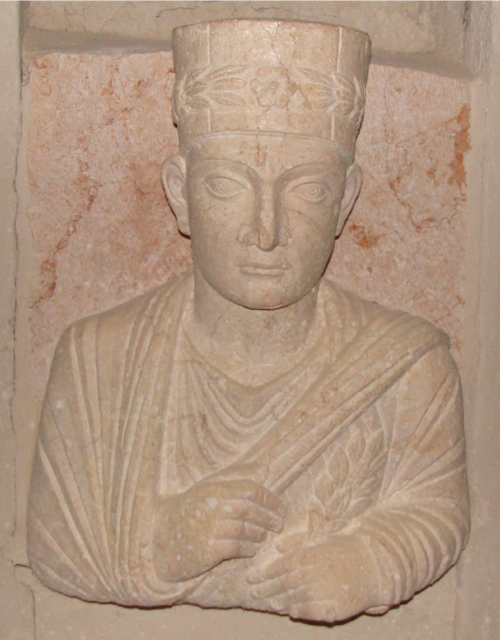 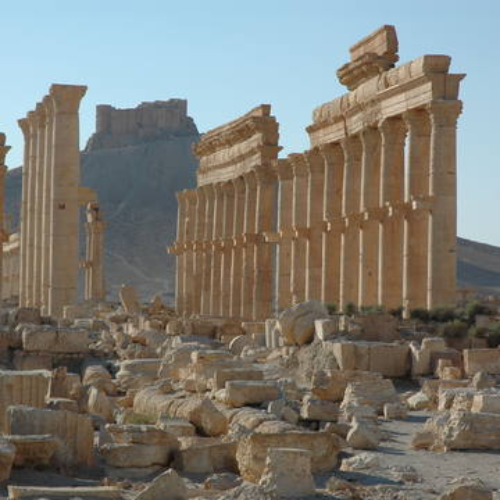 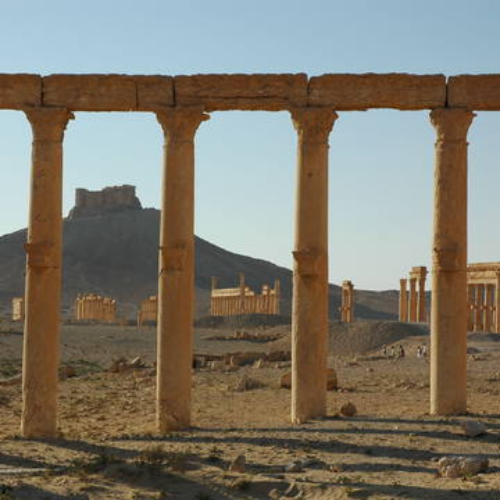 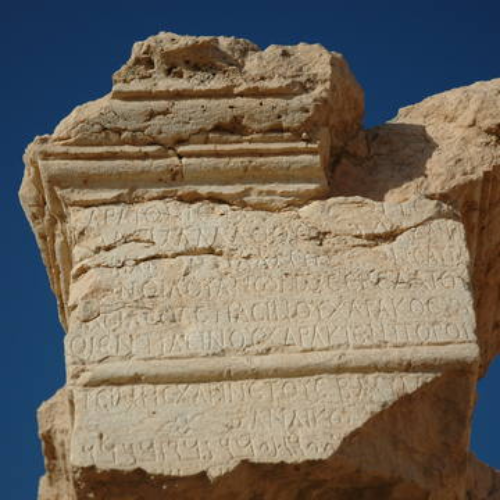 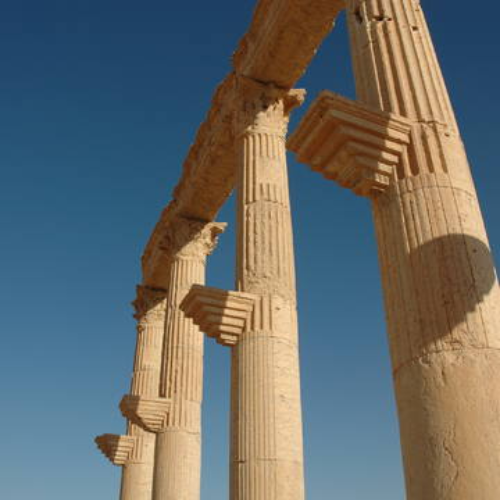 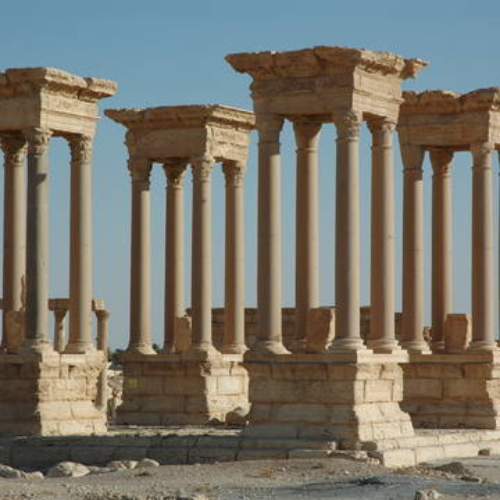 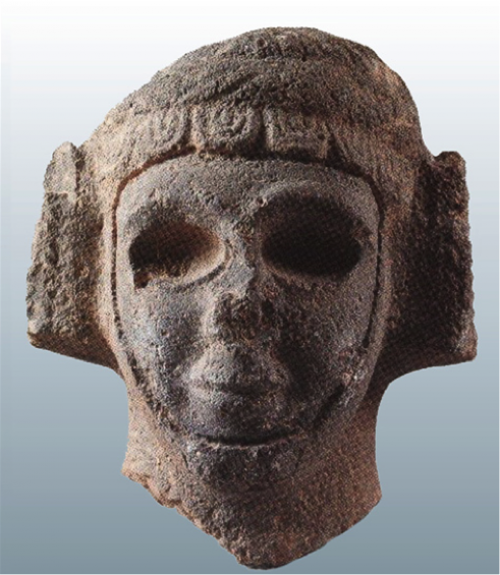 What is the digital mind of Palmyra? 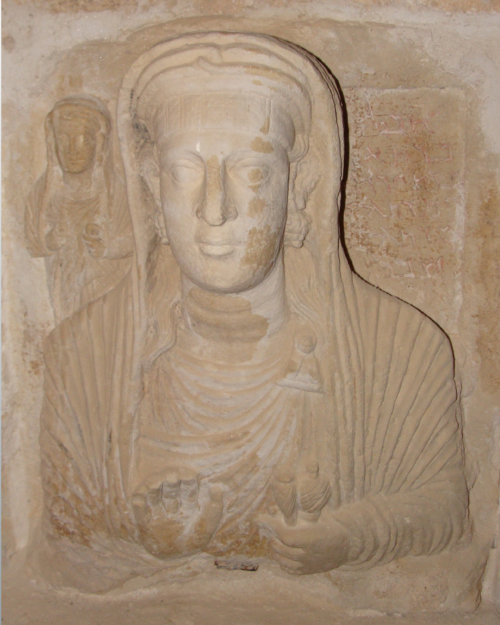 asks Christine Schranz in her work A Journey to Palmyra. 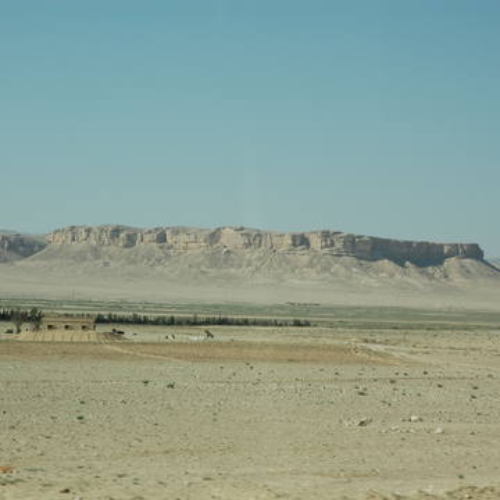 The war-torn country can be explored on the Internet, while it is unreachable in the ‘real world.’ Its infrastructure is visible, but in fact most of it is damaged or controlled by various interest groups. 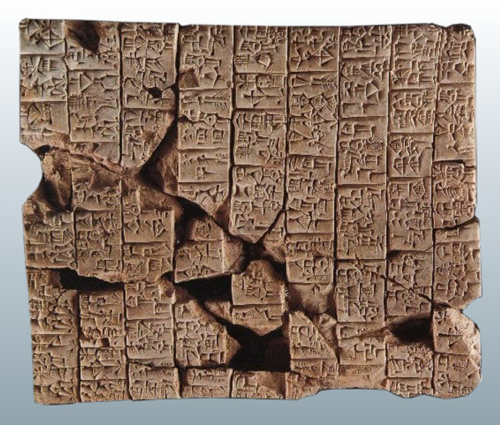 The Internet has come to an unregulated space. 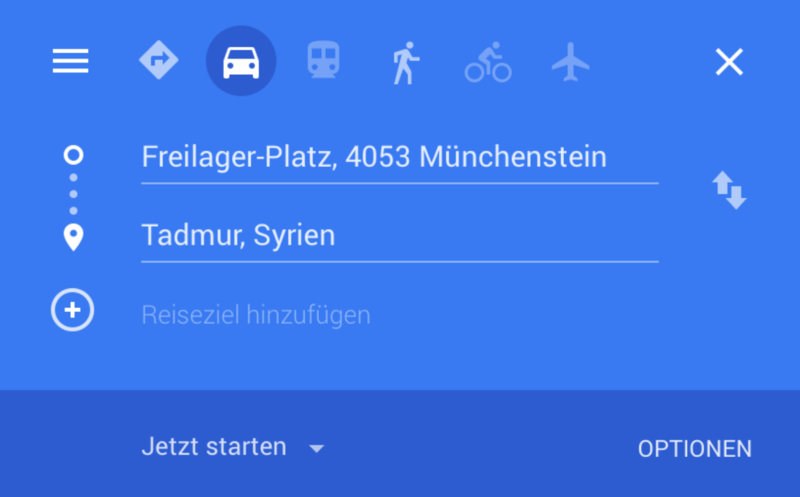 With their map services, Google and others decide how this public space is perceived. 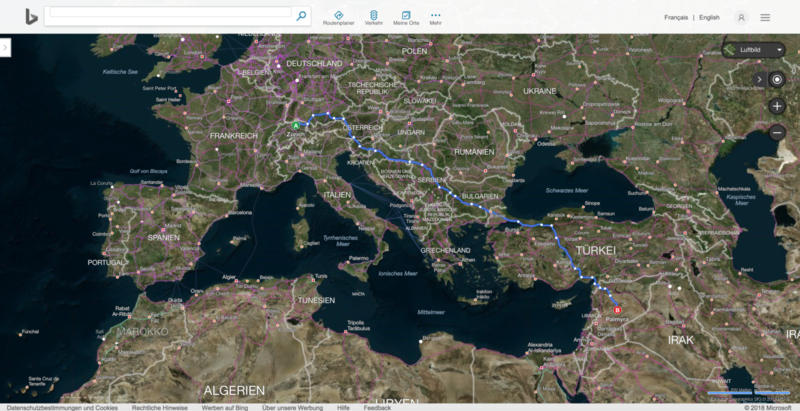 By collecting and providing data, they create their own perspectives of the world. 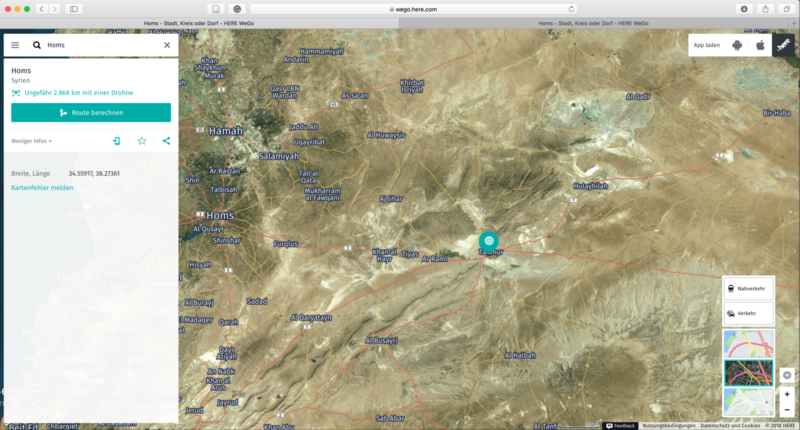 This raises questions about who provides the information and who chooses which information is visible. 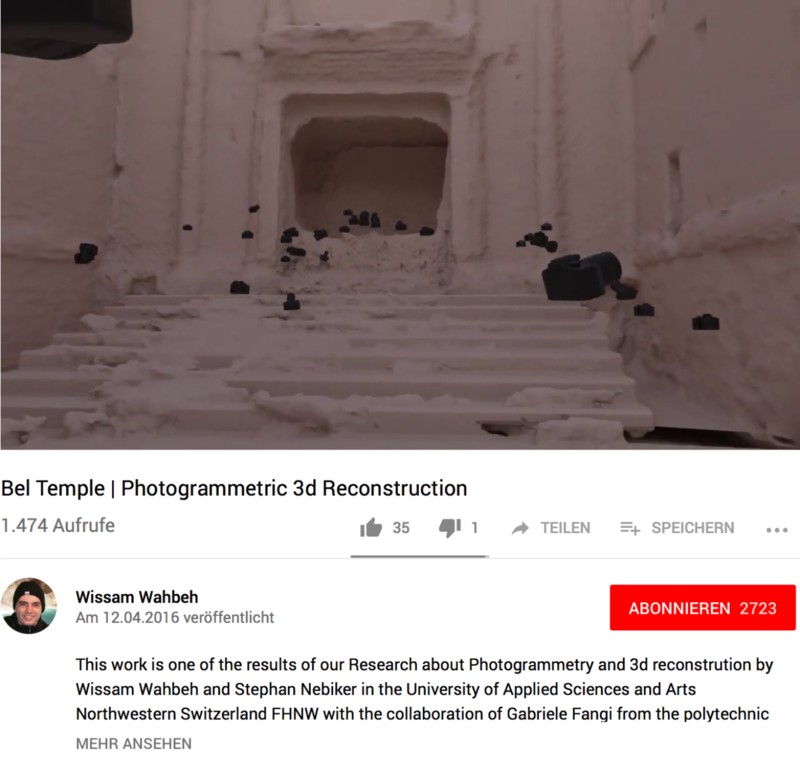 The intention behind the project was to explore an inaccessible location through its remains and through semantic information left on the Internet. 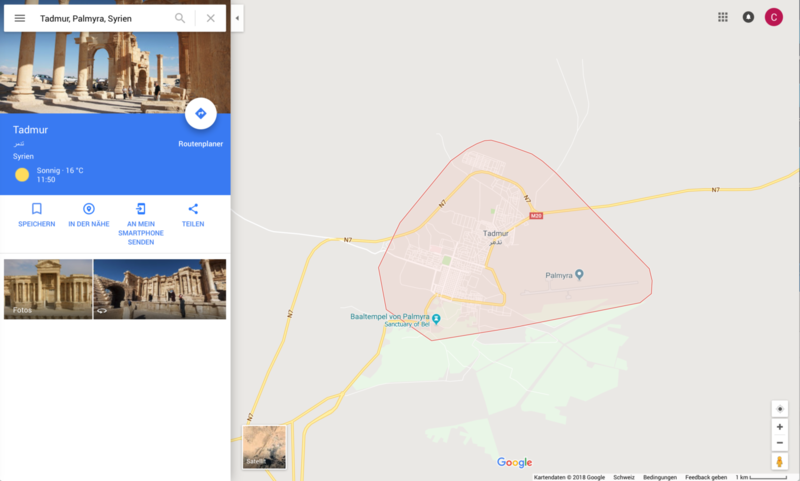 The website consists of several Layers or, rather, realities (including location-based services from Google Maps, private tourist photos from Flickr, real-time information from Reuters, and Twitter or cultural information from Interpol and UNESCO). 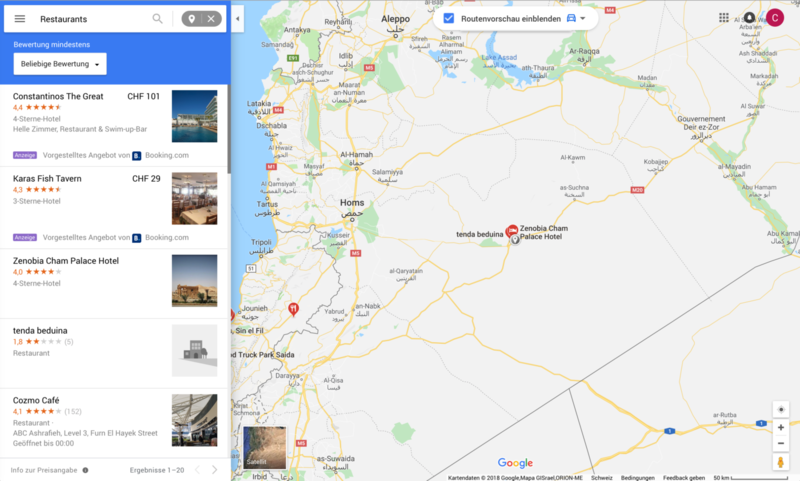 Google Maps are displayed and can be layered with one or more of the layers showing photos and the information from Google, Flickr, Reuters, Twitter, Interpol, or UNESCO on the site itself. 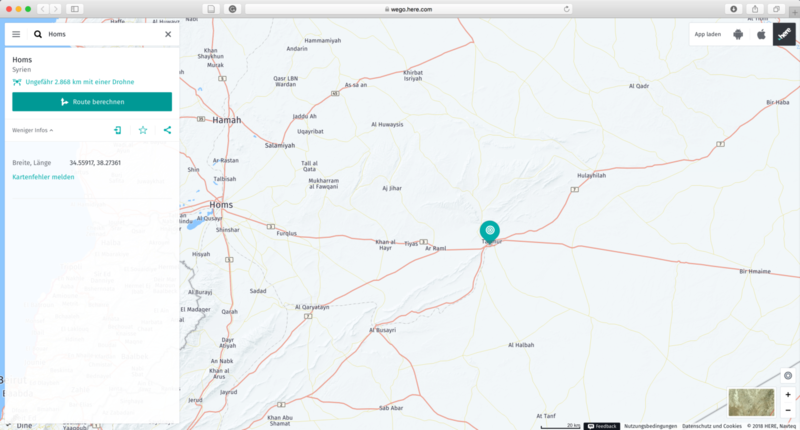 Thus, the map is juxtaposed with real-time information about the war zone—the real, or what can be considered as real with the information available: the mediated or media-influenced constructed world. 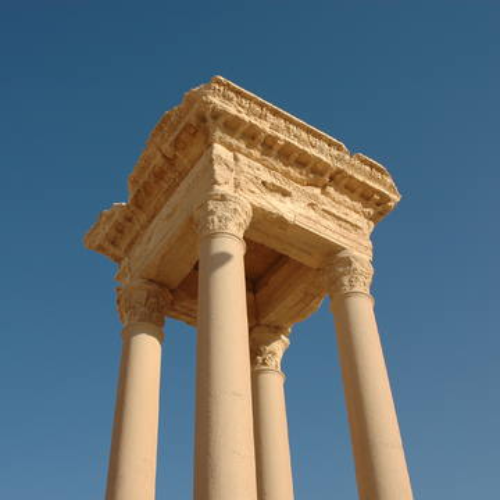 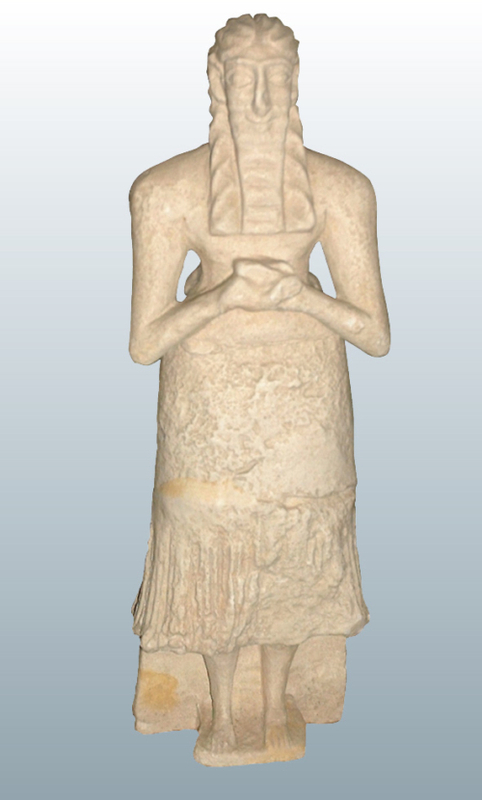 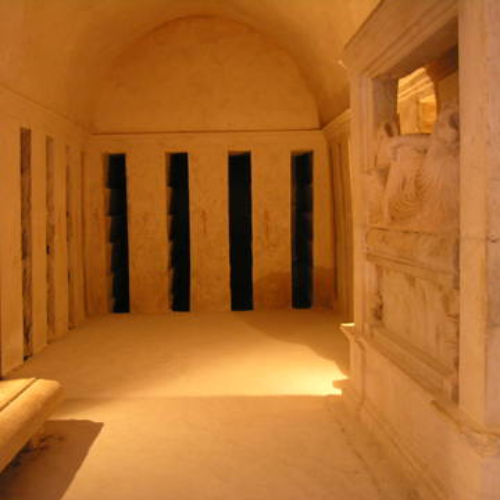 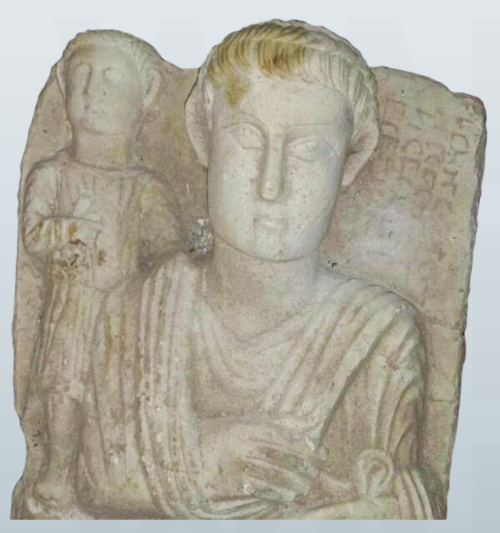 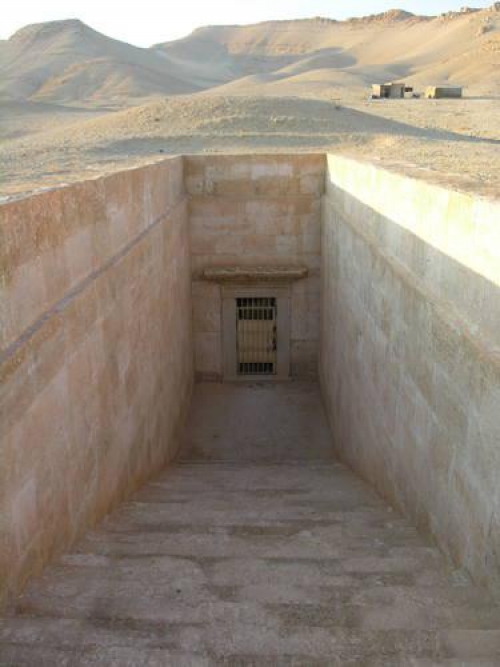 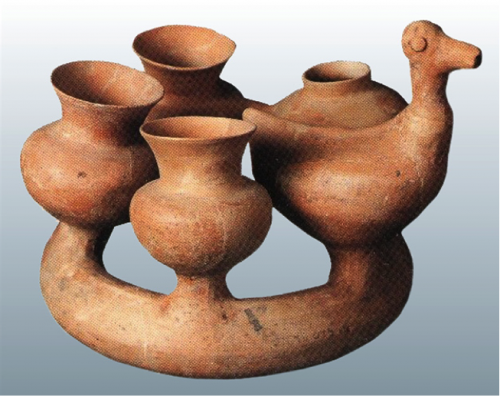 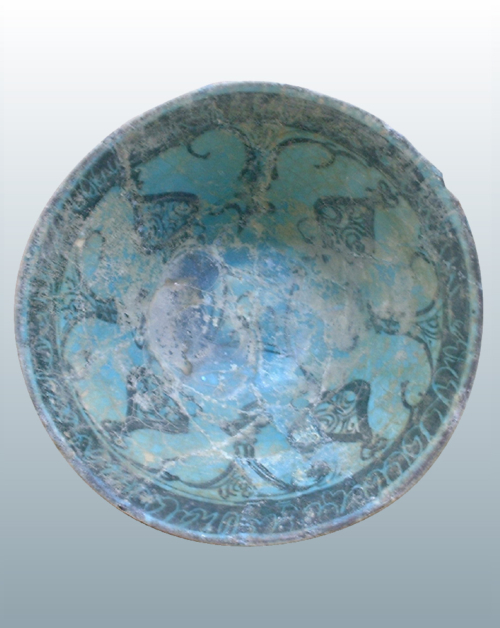 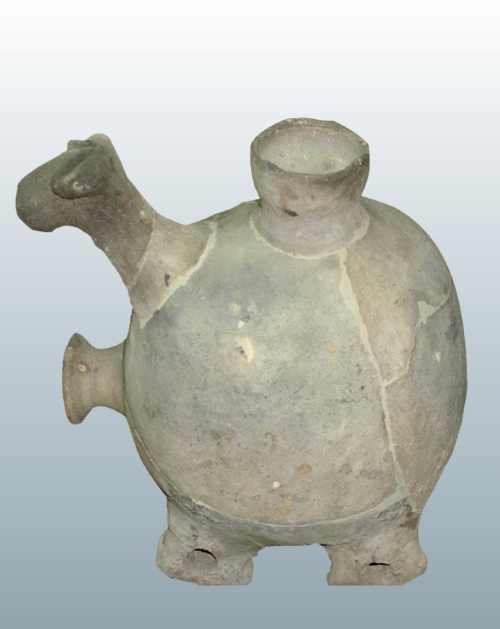 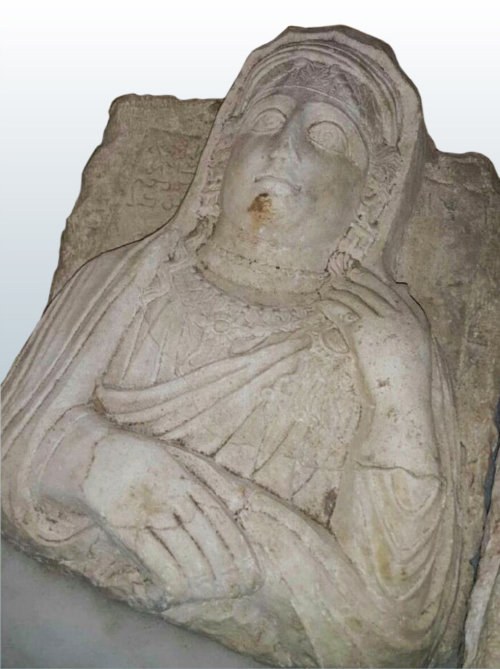 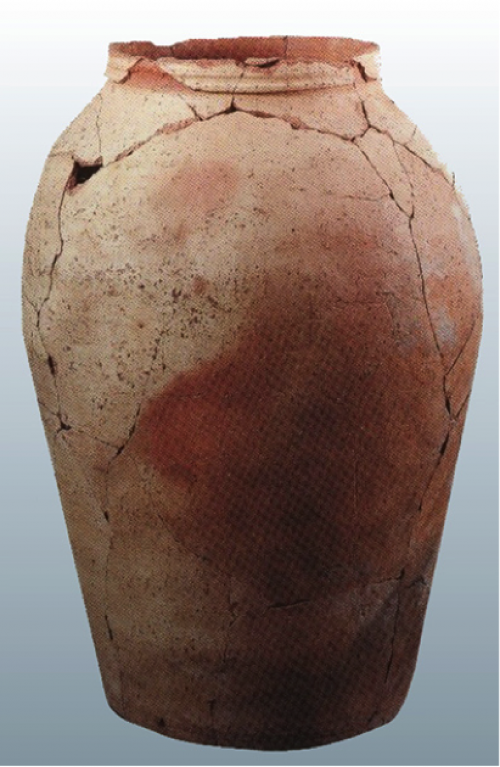 The Protocol contains the knowledge collected during the journey to Palmyra, while the Collection shows the process and documentation of the work on the website.